Ideal for groups so you can try a few different plates, since there's a few really good ones. Can't miss: pork head, pork jowl, sirloin, crispy pata. Not as memorable: duck, beef noodles, octopus. This is the Momofuku of Filipino food, from a top chef runner up. Order the entire menu, especially the ribs, everything with pork, the coconut rice, and the sisig. Unlimited beers from a keg for $15. Sizzling Sigig, Pork Belly Adobo and Ribs are favorites, but you can't go wrong with anything in the menu. If they have them, the special crispy chicken wings made with coconut milk are 👌👌👌. Green papaya salad and Bun Bo Nam Bo are worth getting, and the sizzling sisig with coconut rice is a must. 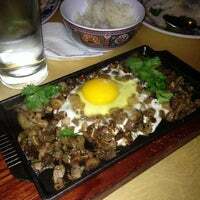 $1 PBR 5-7p, delicious sizzling sisig, sick hip hop soundtrack. Skip the chicharron & go for the jowl -comes w/ chicharron paired perfectly w/ salty watermelon & pork cheek. Don't forget coconut rice! The pork belly adobo with the poached egg is a good small plate to start. Love the octopus salad with the hint of pickled jalapeño. Need to come back for the rest of the menu. 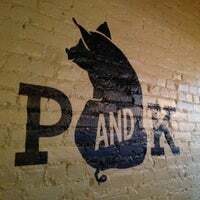 Eat lots of pork, marvel at the crazy flavors! 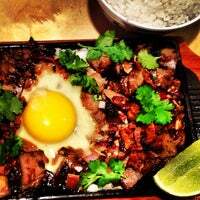 Sizzling Sisig sunny-side up egg atop pile of sizzling, glistening pork head, mix together = delicious harmony. Gr8 with coconut rice. Leah Cohen rocks! Shared the coconut rice, Kao Soi and Pork Belly Adobo with a friend and it was more than enough. Very thick, rich, spicy goodness. Can't wait to come back and try the rest of the menu. get the hainanese duck, the pork belly adobo, and the grilled pork jowl. simply incredible food. great service and nice ambiance. you can't really make a bad choice here. I had an amazing meal here! Everything was so tasty especially the pork belly and the Brussel sprout dish. Also the halo halo was not too sweet and refreshing. 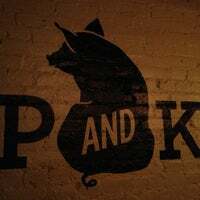 Pork sisig, pork belly adobo, and crispy pata are a few classics in the Philippines, and they did a great job putting their own twist in these signature dishes! Full on flavors of the Khao Soi are out of this world. Pair the lively flavors with a solid light beer and be sure to have plenty of coconut rice on hand. This place is totally, mind-blowingly, good. YUM. 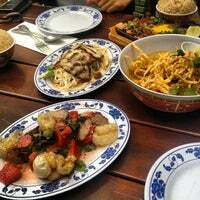 Amazing Thai & Filipino fusion food. If you're with a large group, go with the Chef's special so you can try as many things as possible. The Lower East Side cocktail paired perfectly as well. So delicious, the hype is real. 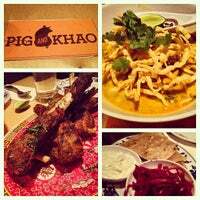 Khao soi, sizzling sisig, ribs and coconut rice are all must haves. 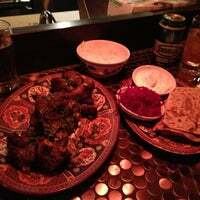 You really can't go wrong with the menu and don't forget to enjoy the fun atmosphere. The sisik was delicious and so was their mango salad. Must get the garlic fried rice to top it off. It's only a bowl so you may want to order two (or more!) if there's more than two of you. Absolutely worth any wait. For a group of four, we did one large plate and three small plates, but could’ve done one more small. Gotta get the duck, Bun Bo Nam Bo, Pork Belly Adobo, & Sizzling Sisig. 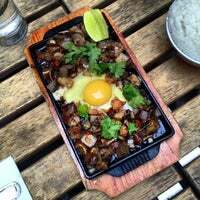 The sizzling sisig is a must, and while it is a bit too salty like most versions of this dish tend to be, it is otherwise really well seasoned, and pairs perfectly with a side of coconut rice. 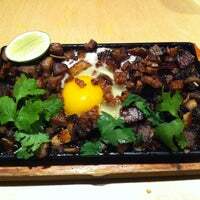 Sizzling sisig is the way to go here. Comes out on a sizzling plate and you get to mix an egg into the dish. Delicious AND fun! Great (semi) new spot in the LES. 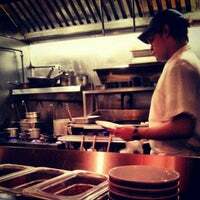 Ambiance is chill and familiar, while food was interesting and delicious. Lamb ribs were the winner for us; spicy, intensely flavored while not being too heavy. Filipino and Thai fusion served as small plates. Interesting flavors! We highly recommend the quail wings and the crispy red curry rice. Good to go with a group and share a bunch of plates. Fantastic thoughtful flavors. Khao soi a must and really not a small plate as advertised. Rich and delicious. Loved the mussels with delicious pretzel-like buns. Also must have the quail adobo! If you want a meal that will make you cry with joy, get the lamb ribs. They come with tzatziki, pickled red cabbage and roti so you can make wraps. So good a lamb would eat them. One of the best meals I've had in a while! Everything is great. 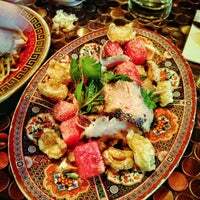 Try the pork jowl and crispy rice salad. My favs were the sisig and lamb ribs. We almost licked our plates clean! You usually can't go wrong with Bottomless Mimosa and plus the food is amazing. Try the Khan Soi and Garlic Friend Rice. Love this place! The ribs, coconut rice, adobo pork belly and the Khao soi are all winners. Wash it down with a Hitachino ginger beer that complements the food perfectly. Awesome brunch with no waits. Banh xeo and chili pan new both great. 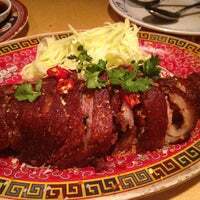 Forget eggs Benedict and go for Laotian. bottomless mimosa brunch is the way to go (there's also a bottomless yuengling draft option). reservations recommended, it's small. One of the best meals outside of Asia I've had in the US. Adding this to my go-to list of awesome, unassuming restaurants in NYC. Get the sirloin and the coconut rice. The best Halo Halo I've had in the states. Simple clean and without all the fillers like beans. 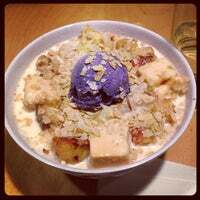 All the best elements of a halo halo in one bowl. Pork belly adobo is srsly the best i've had. Chicken wings are amazing and the coconut rice is just the right amount of sweetness that i can devour it all without feeling sick. I had the wings and they blew my mind. Plus, Leah (the owner) is pretty awesome, so you should definitely check it out! We bring our out of town guests here quiet frequently and the pork jowl over brussel sprouts is always a favorite. I also love Chef Cohen's version of halo halo. Sizzling sissig is a must. 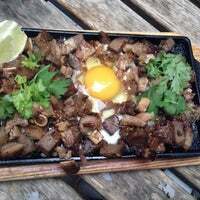 All the best parts: chewy pig's ear, crunchy skin, and fatty delicious pork topped with a sunny side up egg. Devour over coconut rice. You can split a Coconut/Jasmine Rice between two people. No need to go crazy. Even the small plates will fill you up. A must for brunch. 15$ all you can drink mimosas and 15$ self serve all you can drink Yiengling! Also order family style if you're with a big group. David Chang create a new breed of Asian-American comfort food with Fatty Crew (Fatty ’Cue, Fatty Crab), but at Pig and Khao, the formula doesn’t work as smoothly. Filipino deserts, halo-halo, pinipig. Everything was REALLY good. My ranking of what we got: pork jowl > papaya salad > sizzling sisig > wings > khao soi. The Mr. Horchata was also great! Get the cod in banana leaf, pork jowl with Brussels, and multiple sides of coconut rice because it's just that good. And don't forget to pay with Cover! 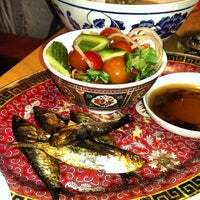 Top Chef Leah Cohen's Southeast Asian inspired restaurant. "brunch!!! Get the Tocino (7 up pork), Laing (taro-root leaves, coconut milk & guisaido bagoong), Flip'D Chicken and Ube purple yam Waffle, compound anchovy-bagoong butter & caramelized macapuno syrup"
"The chicken, green papaya soup in a coconut is amazing. 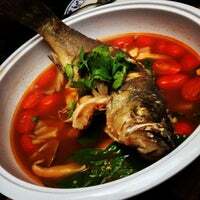 Subtly sweet and savory; the broth-soaked coconut meat at the end is a mouthwatering treat." "Try the pork belly and sinigang na bangus! Everything's good specially the service! :)"
"Great bubble teas - many flavours: matcha, cinnamon, chocolate.. you can choose what milk you like and also put tapioca pearls ;)"
"Excellent, diverse, cozy cocktail bar that can be great for dates. Get there before 9 though on the weekends...seats are hard to come by after that"
"Lugar especial!!!! Me senti na NY dos anos 20!!!" Quick, I need a date spot.